Soil Requirement: Well drained preferred. Quite tolerant of a wide range of soils although. We are proud to present our Renowned Batik Iris Collection. 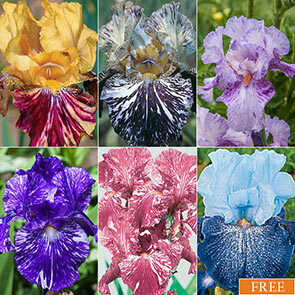 These amazing hybrids are the result of painstaking research and hard work by growers including noted iris hybridizer Brad Kasperek. 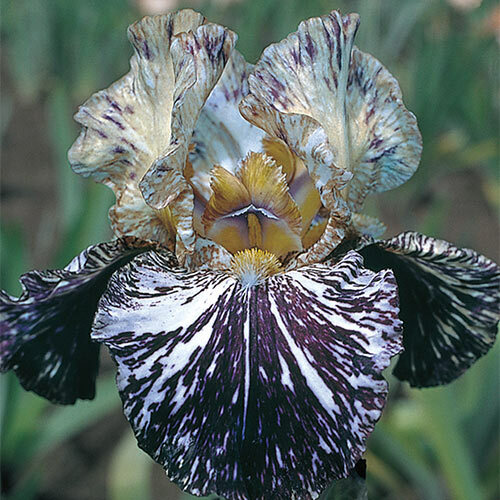 After years of crossbreeding, they were able to arrest the normal production of pigment in certain German iris, thus causing it to turn on and off randomly. The results are simply magnificent. Streaks of white embellish the standards and falls of every bloom. Like their namesake, each individual flower seems to have been hand dyed—unique works of art for your borders, beds or cut-flower arrangements. By ordering our collection, you will be among some of the few home gardeners lucky enough to display these rare, breathtaking blooms. 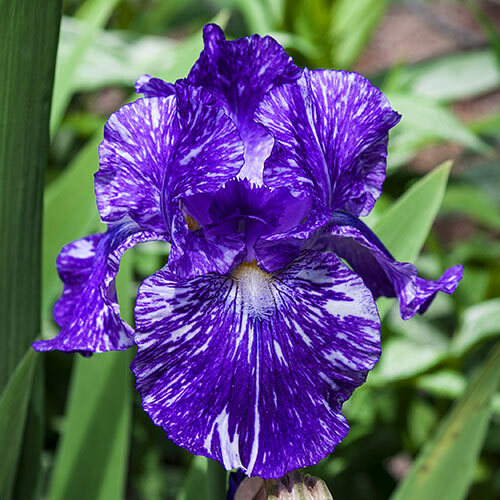 Batik irises beautifully fill empty spaces in full sun to partial shade, their swordlike leaves growing in attractive fans. 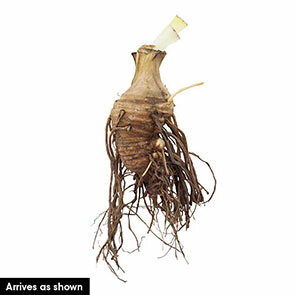 Capable of crowding out weeds, they are often planted en masse or in a thick row, so as to form a lush border. 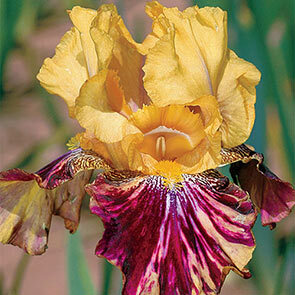 In large gardens, it is not uncommon to see mass plantings in the range of 100 to 150 bearded irises. Since our batik varieties multiply annually, you too will be able to divide them in future years and enjoy such magnificent tapestries of colour. In the ancient art of batik, a skilled craftsman uses a tiny brass needle to drizzle hot liquid wax onto plain white fabric, painstakingly drawing tiny, delicate lines. When his drawing is complete, the fabric is dyed and the wax dissolves. 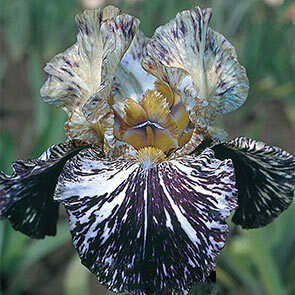 Then the process is repeated with more deep, rich colours until an intricate and breathtaking design is revealed. Truly a treasure. Ziggy: Soft yellow standards are infused with velvety lavender at the midribs. White-yellow falls are heavily overlaid with bright reddish-purple mottling. Grows 29" tall. Gnus Flash: Brilliant standards lighten from gold to grey with silver streaks. Violet falls are streaked with silver and feature violet-tipped gold beards. Grows 38" tall. Mean Streak: Tailored, lavender-pink petals are festooned with magenta veining and dappling. Adding to the colourful allure are bright tangerine beards. Grows 38" tall. Gnu Again: Stunning, statuesque and saturated with colour! 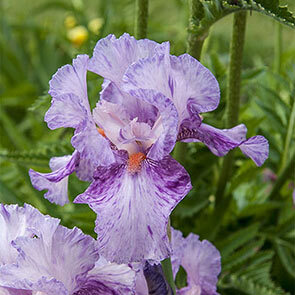 Violaceous blooms are streaked dreamy, creamy white. Violet tips adorn burnt orange beards. Grows 32" tall. 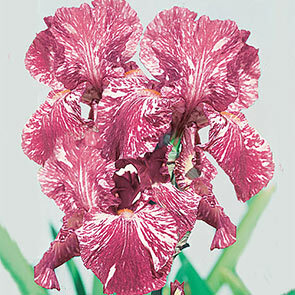 Baboon Bottom: Dramatic swirls and streaks in shades of pink and white bedeck the petals. Tangerine beards are tipped with rose. Grows 26" tall. 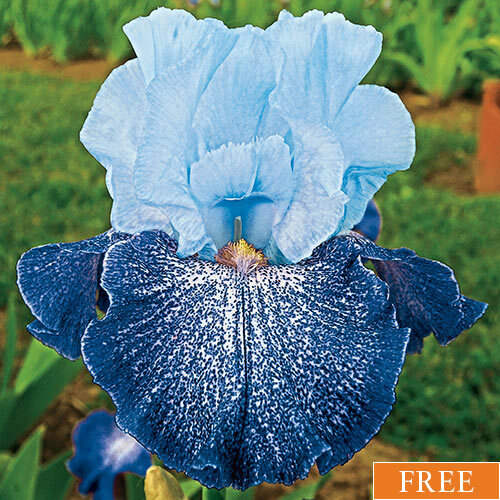 Plus, as a FREE GIFT, with every collection you order we'll send you free Splashacata Iris .Your sun-splashed gardens will come alive with blooms of soft lavender blue standards atop white, finely ruffled falls lavishly speckled in rich ultramarine. 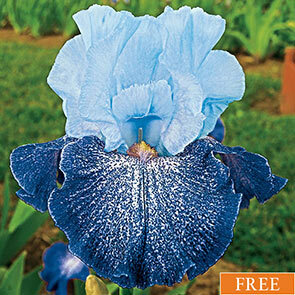 Recipient of the Dykes and Wister medals, two of the highest awards bestowed upon irises. Grows 3' tall. Soil Requirements Well drained preferred. Quite tolerant of a wide range of soils although.